The only spacer available that is specifically designed + purposely built for dual plane intakes with a solid plenum divider using a 4150 style Holley. This includes (as examples) SBC Performer,Performer RPM -not air gap, Stealth, and GMPP dual plane intakes. 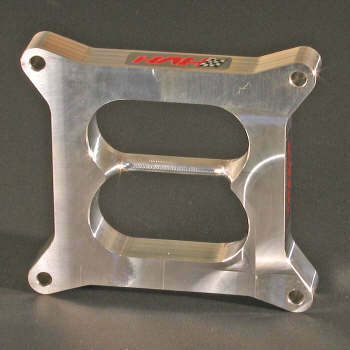 This spacer is CNC machined out of Aluminum. Design, quality and workmanship is unlike any other. If you want the best, this is it.